The roller coaster that was swept right-side up into the Atlantic Ocean as Hurricane Sandy slammed the Jersey Shore may not be torn down, according to Seaside Heights Mayor Bill Akers. 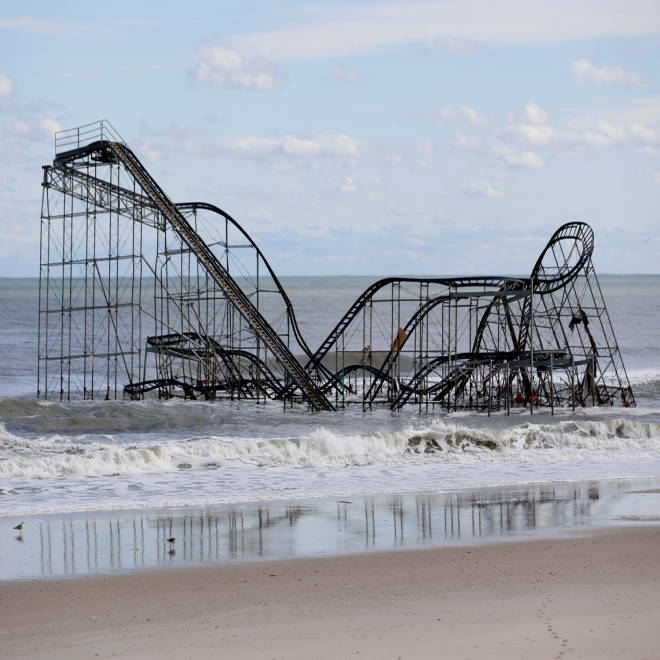 The picture of the ride, which looks more like a water slide these days, has become an iconic image of the damage Sandy wreaked up and down the coast just over three weeks ago. But Mayor Akers, in an exclusive interview with NBC 4 New York, said he is working with the Coast Guard to see if it is stable enough to leave it alone. If it is, Akers said it would make "a great tourist attraction." Meanwhile, demolition crews have already finished removing all of the damaged boardwalk that was the heart and soul of this seaside resort. Businessmen like Mike Mergott of Mad Mike's Amusements said he is rebuilding because he is "one hundred per cent sure" families want to come back. And Jim Loundy, who owned several buildings wiped away by the surge is confident he won't see another storm like this for "another fifty or sixty years." Mayor Akers said construction on a new boardwalk should begin in January, and be ready by Memorial Day. A rollercoaster that once sat on a pier in Seaside Heights, N.J., rests in the ocean after the pier was washed away by Superstorm Sandy,Oct. 31, 2012.